Mother's Day in the United States is an annual holiday celebrated on the second Sunday in May. Mother's Day recognizes mothers, motherhood and maternal bonds in general, as well as the positive contributions that they make to society. It was established by Anna Jarvis, with the first official Mother's Day celebrated at St. Andrew's Methodist Church in Grafton, West Virginia, on May 10, 1908. In the United States, Mother's Day complements similar celebrations honoring family members, such as Father's Day, Siblings Day and Grandparents Day. Internationally, there are a large variety of Mother's Day celebrations with different origins and traditions, some now also having been influenced by this more recent American tradition. During the 19th century, women's peace groups in the United States tried to establish holidays and regular activities in favor of peace and against war. A common early activity was the meeting of groups of mothers whose sons had fought or died on opposite sides of the American Civil War. In 1868, Ann Jarvis, Anna Jarvis's mother, organised a committee to establish a "Mother's Friendship Day", the purpose of which was "to reunite families that had been divided during the Civil War." Ann Jarvis, who had previously organized Mother's Day Work Clubs to improve sanitation and health for both Union and Confederate encampments undergoing a typhoid outbreak, wanted to expand these into an annual memorial for mothers, but she died in 1905 before the annual celebration was established. Her daughter, who became almost obsessed with her, would continue her mother's efforts. There were several limited observances in the 1870s and the 1880s but none achieved resonance beyond the local level. At the time, Protestant schools in the United States already held many celebrations and observations such as Children's Day, Temperance Sunday, Roll Call Day, Decision Day, Missionary Day and others. In New York City, Julia Ward Howe led a "Mother's Day for Peace" anti-war observance on June 2, 1872, which was accompanied by a "Appeal to womanhood throughout the world" (nowadays known as Mother's Day Proclamation). The observance continued in Boston for about 10 years under Howe's personal sponsorship, then died out. In these celebrations, mothers all around the world would work towards world peace. Several years later a Mother's Day observance on May 13, 1877 was held in Albion, Michigan over a dispute related to the temperance movement. According to local legend, Albion pioneer Juliet Calhoun Blakeley stepped up to complete the sermon of the Rev. Myron Daughterty who was distraught because an anti-temperance group had forced his son and two other temperance advocates at gunpoint to spend the night in a saloon and become publicly drunk. From the pulpit Blakeley called on other mothers to join her. Blakeley's two sons, both traveling salesmen, were so moved that they vowed to return each year to pay tribute to her and embarked on a campaign to urge their business contacts to do likewise. At their urging, in the early 1880s, the Methodist Episcopal Church in Albion set aside the second Sunday in May to recognize the special contributions of mothers. Frank E. Hering, alumnus and administrator at the University of Notre Dame and President of the Fraternal Order of Eagles, made a plea for "setting aside one day in the year as a nationwide memorial to the memories of Mothers and motherhood" in 1904. After observing a class of Notre Dame students sending home penny postcards to their mothers, Hering went on to be a vocal advocate for a national Mother's Day for the next decade. As Hering stated in a 1941 issue of Scholastic: "Throughout history the great men of the world have given their credit for their achievements to their mothers. [The] Holy Church recognizes this, as does Notre Dame especially, and Our Lady who watches over our great institution." In its present form, Mother's Day was established by Anna Jarvis with the help of Philadelphia merchant John Wanamaker following the death of her mother, Ann Jarvis, on May 9, 1905. Jarvis never mentioned Howe or Mothering Sunday, and she never mentioned any connection to the Protestant school celebrations, always claiming that the creation of Mother's Day was hers alone. A small service was held on May 12, 1907 in the Andrew's Methodist Episcopal Church in Grafton, West Virginia, where Anna's mother had been teaching Sunday school. The first "official" service was on May 10, 1908, in the same church, accompanied by a larger ceremony in the Wanamaker Auditorium in the Wanamaker's store in Philadelphia. The next year the day was reported to be widely celebrated in New York. Jarvis then campaigned to establish Mother's Day first as a U.S. national holiday and then later as an international holiday. The holiday was declared officially by the state of West Virginia in 1910, and the rest of the states followed quickly. On May 10, 1913, the U.S. House of Representatives passed a resolution calling on all federal government officials (from the president down) to wear a white carnation the following day in observance of Mother's Day. 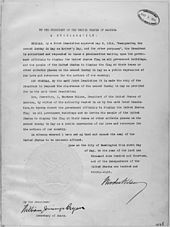 On May 8, 1914, the U.S. Congress passed a law designating the second Sunday in May as Mother's Day and requesting a proclamation. The next day, President Woodrow Wilson issued a proclamation declaring the first national Mother's Day as a day for American citizens to show the flag in honor of those mothers whose sons had died in war. In 1934, U.S. President Franklin D. Roosevelt approved a stamp commemorating the holiday. In May 2008, the U.S. House of Representatives voted twice on a resolution commemorating Mother's Day, the first one being passed without a dissenting vote (21 members not voting). The Grafton church, where the first celebration was held, is now the International Mother's Day Shrine and is a National Historic Landmark. Traditions on Mother's Day include churchgoing, the distribution of carnations, and family dinners. Mother’s Day is the third largest holiday in the United States for sending cards. According to the greeting card industry, it is estimated that more than 50 percent of American households send greeting cards on this holiday. The holiday has been heavily commercialized by advertisers and retailers, and has been criticized by some as a Hallmark Holiday. Carnations have come to represent Mother's Day since Anna Jarvis delivered 500 of them at the first celebration in 1908. Many religious services held later adopted the custom of giving away carnations. This also started the custom of wearing a carnation on Mother's Day. The founder, Anna Jarvis, chose the carnation because it was the favorite flower of her mother. In part due to the shortage of white carnations, and in part due to the efforts to expand the sales of more types of flowers in Mother's Day, florists invented the idea of wearing a pink carnation if your mother was living, or a white one if she was dead; this was tirelessly promoted until it made its way into the popular observations at churches. Other less traditional flower options may include roses, a live blooming plant, flower leis, or a bouquet of a variety of different flowers. The commercialization of the American holiday began very early, and only nine years after the first official Mother's Day it had become so rampant that Anna Jarvis herself became a major opponent of what the holiday had become, spending all her inheritance and the rest of her life fighting what she saw as an abuse of the celebration. She decried the practice of purchasing greeting cards, which she saw as a sign of being too lazy to write a personal letter. She was arrested in 1948 for disturbing the peace while protesting against the commercialization of Mother's Day, and she finally said that she "...wished she would have never started the day because it became so out of control ..." She died later that year. Mother's Day is now one of the most commercially successful American occasions, having become the most popular day of the year to dine out at a restaurant in the United States and generating a significant portion of the U.S. jewelry industry's annual revenue, from custom gifts like mother's rings. Americans spend approximately $2.6 billion on flowers, $1.53 billion on pampering gifts—like spa treatments—and another $68 million on greeting cards. Commercialization has ensured that the holiday has continued, while other holidays from the same time, such as Children's Day and Temperance Sunday, are no longer celebrated. From 2005 to 2013, the Southern 500 auto race was held on Saturday of Mother's Day weekend. Since 2014, the NASCAR Cup Series hosts the KC Masterpiece 400 at Kansas on Saturday of Mother's Day weekend. Also, the IndyCar Grand Prix has been held on Saturday of Mother's Day weekend since 2014. From 2007-2018, The Players Championship men's golf tournament was held on Mother's Day weekend, except in 2011 and 2016 when May 1 fell on a Sunday. In those cases, it was held the next weekend. Previously, the Kingsmill Championship women's golf tournament was played on Mother's Day weekend from 2004 to 2009. Professional sports players often wear pink clothing accessories on Mother's Day weekend. ^ a b J. Ellsworth Kalas (October 19, 2009). Preaching the Calendar: Celebrating Holidays and Holy Days. Westminster John Knox Press. Church attendance on this day is likely to be third only to Christmas Eve and Easter. Some worshipers still celebrate with carnations, colored if the mother is living and white if she is deceased. ^ O'Reilly, Andrea (April 6, 2010). Encyclopedia of Motherhood. Sage Publications (CA). p. 602. ISBN 978-1-4522-6629-9. She organized the first official Mother's Day service at Andrews Methodist Church in Grafton, West Virginia, on the morning of May 10, 1908. That same afternoon, 15,000 people attended a Mother's Day service at the Wanamaker Store Auditorium in Philadelphia, which she also organized. Jarvis chose the second Sunday in May for Mother's Day to mark the anniversary of her mother's death and selected her mother's favorite flower, the white carnation, as the day's official emblem. ^ O'Reilly, Andrea (2010). Encyclopedia of Motherhood. SAGE Publications. p. 972. ISBN 9781452266299. ^ a b c d e f g h Virginia Bernhard (2002). "Mother's Day". In Joseph M. Hawes, Elizabeth F. Shores (ed.). The family in America: an encyclopedia (3, illustrated ed.). ABC-CLIO. p. 714. ISBN 978-1-57607-232-5. 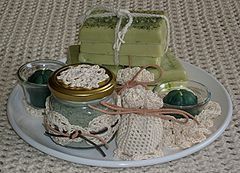 ^ The First Anniversary of 'Mother's Day'", The New York Times, June 3, 1874, p. 8: "'Mother's Day,' which was inaugurated in this city on the 2nd of June, 1872, by Mrs. Julia Ward Howards[sic], was celebrated last night at Plimpton Hall by a mother's peace meeting..."
^ a b c "The Father of Mother's Day | Notre Dame Archives News & Notes". www.archives.nd.edu. Retrieved April 27, 2016. ^ "Fraternal Order of Eagles: The History of Mother's Day". Archived from the original on April 15, 2008. Retrieved January 26, 2008. ^ Express (Washington, D.C.), May 10, 2013, p. 30. ^ Compare footnote 51 in LaRossa, Ralph (1997). The Modernization of Fatherhood: A Social and Political History. University of Chicago Press. p. 272. ISBN 9780226469041. Retrieved April 28, 2016. Technically, at least, Mother's Day was 'owned' by Jarvis. She managed not only to incorporate the Mother's Day International Association, but also to register 'Second Sunday in May, Anna Jarvis, Founder,' as the organization's trademark. ^ a b c Louisa Taylor, Canwest News Service (11 May 2008). "Mother's Day creator likely 'spinning in her grave'". Vancouver Sun. Canada. Archived from the original on 14 May 2008. Retrieved 7 July 2008. ^ Brian Handwerk (May 11, 2012). "Mother's Day's Dark History". National Geographic News. Retrieved May 30, 2013. ^ Marc Powers (May 11, 1996). "Mother's Day only a Hallmark holiday". Southeast Missourian. Retrieved May 11, 2013. ^ a b "Mother's Day reaches 100th anniversary, The woman who lobbied for this day would berate you for buying a card". MSNBC. Associated Press. May 11, 2008. Retrieved July 7, 2008. "More Than Six Out of 10 Americans Will Have Their Mother's Day Meals at Restaurants, New National Restaurant Association Research Reveals". National Restaurant Association. May 4, 2006. "Mother's Day Dining Fact Sheet". National Restaurant Association. April 28, 2006. ^ Barnett Helzberg (2003). John Wiley and Sons (ed.). What I Learned Before I Sold to Warren Buffett. p. 80. ISBN 0-471-44539-8. ^ Leigh, page 256 "... it might even have gradually withered away like other Protestant days of the early twentieth century such as Children's Day or Temperance Sunday." Larossa, Ralph (1997). The Modernization of Fatherhood: A Social and Political History (illustrated ed.). University of Chicago Press. p. 90,170–192. ISBN 0-226-46904-2. Leigh, Eric Schmidt (1997). Consumer Rites: The Buying and Selling of American Holidays (reprint, illustrated ed.). Princeton University Press. pp. 256–275. ISBN 0-691-01721-2.